Recently, we saw Michael Pollan talk at the Opera House. He was awesome. 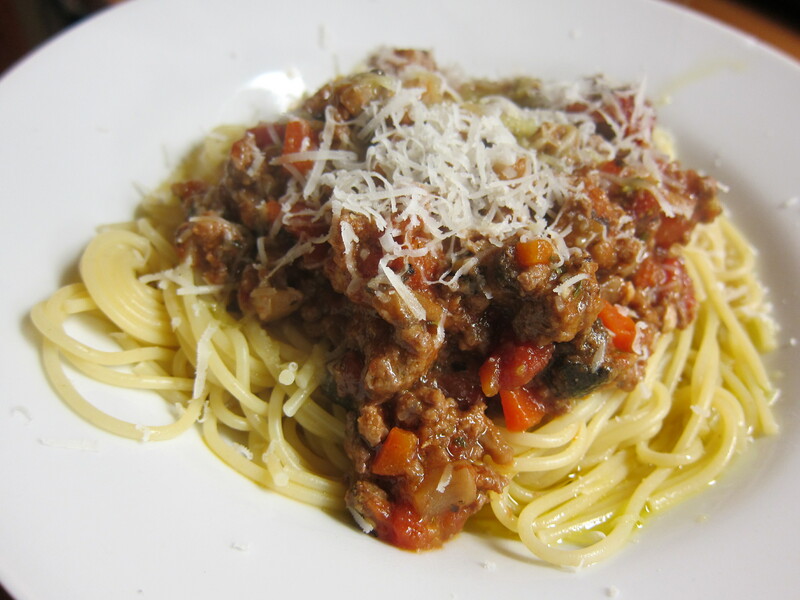 So here is my Pollan-inspired version of bolognese, made with “mostly plants”. It reminds me of my step-mum’s vege pasta sauce – made from broccoli, celery, carrot, zucchini, tomato, oregano and basil – which was the only way she could get me to eat vegetables when I was little. It’s now one of my favourite comfort foods. Finely dice the onion, fennel, carrot, mushrooms and eggplant (keep separate). Heat some olive oil a large saucepan and fry the anchovies until melted. Add garlic, allow to become fragrant, then add the onion and fennel. Allow to soften. Add the mince and break up with a wooden spoon. When browned, add the carrots, mushrooms and eggplant. Saute for 10 minutes. When milk has been absorbed/evaporated, tip in the tomatoes, bay leaves and season with salt and pepper. Add a dash of red wine vinegar towards the end if it needs a bit of a lift.